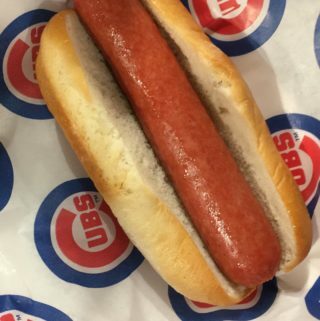 Gluten-free hot dogs at Wrigley Field! And beer! Big news!! All of the stars have aligned. 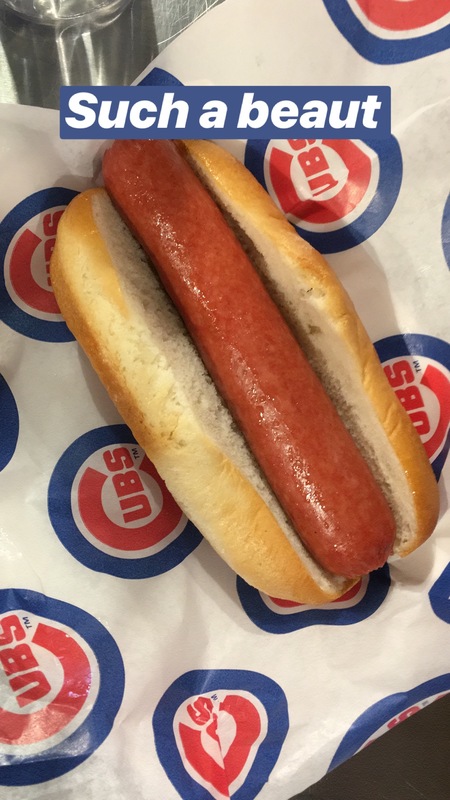 Gluten-free hot dogs are BAAACK at Wrigley Field in Chicago! You can find GF hot dogs and GF buns at Marquee Classics, near Aisle 120. I’ve never been happier. I ate two last night. The GF hot dog is not listed on the menu board, so you’ll feel like a real pro ordering from a secret menu. Redbridge gluten-free beer is available at Wrigley and you can find it at the beer/wine stand near Aisle 122. There are various stands around the ballpark with Stella Cidre. And, obviously, various cocktail/wine stands. Let’s be real, you’re here for the hot dogs but just in case – you can also get a Fruit Cup or a Veggie Chopped Salad at the following locations: Chicago Dogs (Aisle 118 and 123) or Waveland Grill (lower bleachers, left field). There are various packaged chips as well as Garrett’s popcorn. See this link for other dietary restrictions – vegan/vegetarian/kosher, etc. Outside of Wrigley Field itself, Wrigleyville now has a ton of gluten-free options. It used to be a bit of a food desert (GF or not), but we’ve got some solid options these days with all the recent additions and renovations. Big Star – Tacos & margs. 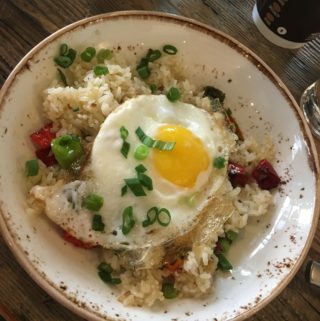 Sister of the Wicker Park location, Big Star is super GF friendly. Servers are very knowledgeable about GF taco options. Smoke Daddy – BBQ! Also sister of the Wicker Park Smoke Daddy. Meats are GF – check with your server about sauces and sides. Jeni’s Splendid Ice Creams – Ice cream! They are GREAT about allergies and delicious! Let them know you have Celiac and they’ll get a scoop from a fresh batch in the back. Rockit Burger Bar – Burgers, duh. The burger with a lettuce bun is always a solid option here in a pinch. Anybody been to the new Mordecai, Dutch and Doc’s or West Town Bakery and Tap?? Give me a shout in the comments. Decades Diner was revamped this year into a rotating “Chef Series” menu. When I last went in June (during Steph Izard’s chef run), you could get a gluten-free hot dog with Korean flair at the Sheffield Counter spot on the main concourse. Sadly, I did not successfully find a regular ol’ hot dog anywhere else in the park, though! Ok, while I will always be a true St. Louis Cardinals fan at heart, I have to say how EXCITED I was to learn that there were some legit gluten-free options available at the Cubs’ Wrigley Field in Chicago. I mean the best part of going to a baseball game is eating an overpriced hot dog, right?? 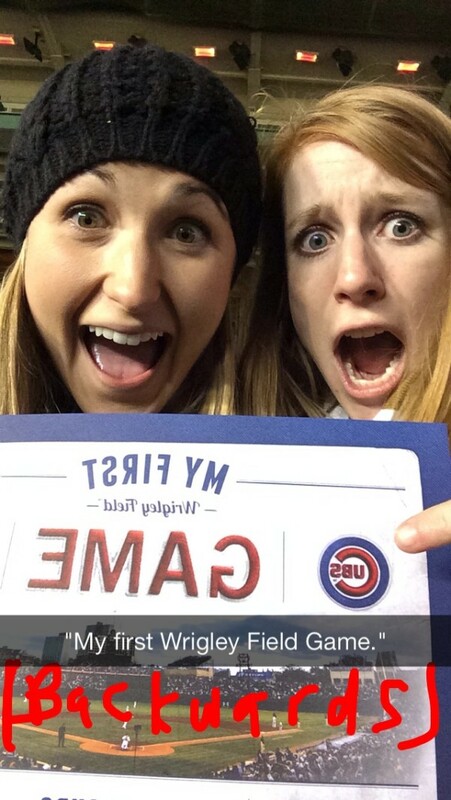 So my first Cubs game ever was in late April 2014 with some girlfriends, when you’d think it might be warm…but no, it was basically winter. Giant puffy-coat caliber weather, plus hats and gloves. Regardless, we had a blast. As this weekday game was totally dead, an adorable elderly usher escorted us down to the empty club seats and let us watch the last few innings of the game along the first baseline. 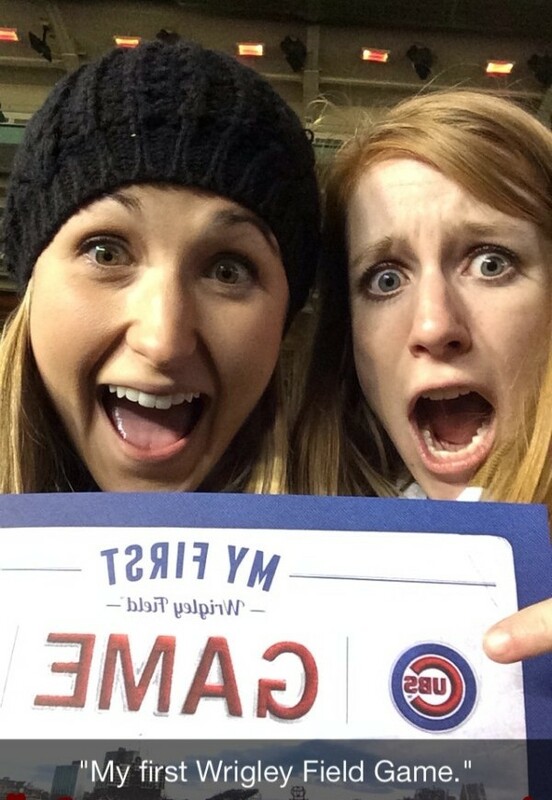 And then he peer pressured me into getting a personalized certificate in honor of “My First Cubs’ Game,” which I have to say, some of my STL crew was none too pleased about. Wrigley Field has gluten-free hot dogs, burgers, and chicken sandwiches in their Decades Diner (formerly, Sheffield Grill), located in the corner of the stadium near right field. In my multiple games at Wrigley, I’ve tried out both the hot dog and the burger, and I’ve gotta say, they’re both excellent. If you’re getting the burger, make sure they don’t put the sauce on it as that is not gluten-free. 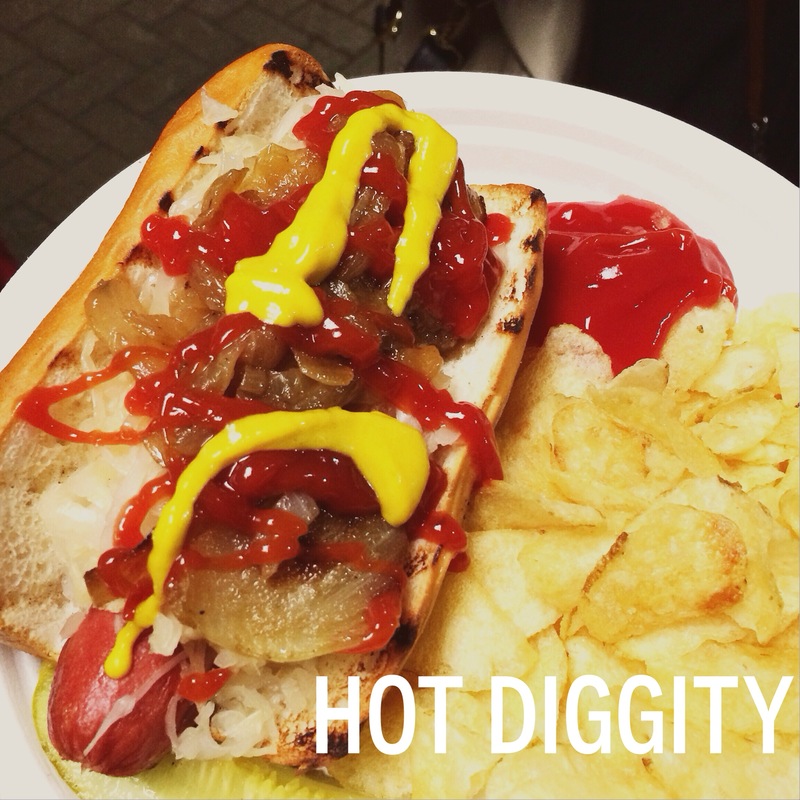 If you’re going with the hot dog, load ‘er up with grilled onions and sauerkraut. The fries are not GF, so they give you a TON of potato chips instead. Wash that bad boy down with a Johnny Appleseed Cider and you’re good to go. Make sure to grab your cider in Decades Diner if you’re low on cash. Decades Diner takes credit, but most of the other drink kiosks that sell cider are cash only. A few other places in Wrigley also have gluten-free snacks. According to Eater, Ground Crew and Brews and Wrigleyville Brew House on the Main Concourse all have additional GF snacks. I’ve personally swung by Ground Crew and Brews to check it out and saw GF popcorn, Red Bridge beer, and a kiddie goodie bag featuring gluten-free AND nut-free items. Pretty sweet for the nut-free crowd. Give a shout-out in the comments below if you’ve come across any good GF snacks there! And get ready to be well-fed at Wrigley Field. Taking the family to our first game. We are from Miami so a ton of GF prep happening. This is super helpful. Thank you so much! Hi Michelle! As of this year they’ve changed the “Decades Diner” to a Stephanie Izard restaurant. They still have a GF hotdog,. but it’s fancier and Asian-inspired. Not sure if there are GF hotdogs elsewhere in the stadium, please let me know what you find! Thanks for reading, let me know if you need any other recos! Going to tomorrow’s game – you just made my day. Hey Dan! This year they changed it up to make it a Steph Izard restaurant, but they do have a specialty hotdog. Did you find it?? do you have to have seats in the bleachers to access the gluten free section? I am sitting near first base but i want to order from the gluten free area. It’s actually easier if you don’t have seats in the bleachers to get to the GF section. But, even if you’re in the bleachers, you should still be able to get back to the main concourse via the corridor facing Sheffield. Hope you enjoyed! I’m so excited to hear there are some great gf options. I’ll be there in July for a business event, and we are sneaking in a game. I’m happy I’ll be able to have the whole experience. Thanks for the update! Thanks for the info! I’m heading to the game tonight and wasn’t sure if I should eat at home first. I’m looking forward to a gf hot dog!! My pleasure, Carolyn! Hope you had a great time and enjoyed that hot dog! Had a gf hot dog at Decades friday, april 17 and it was awesome! 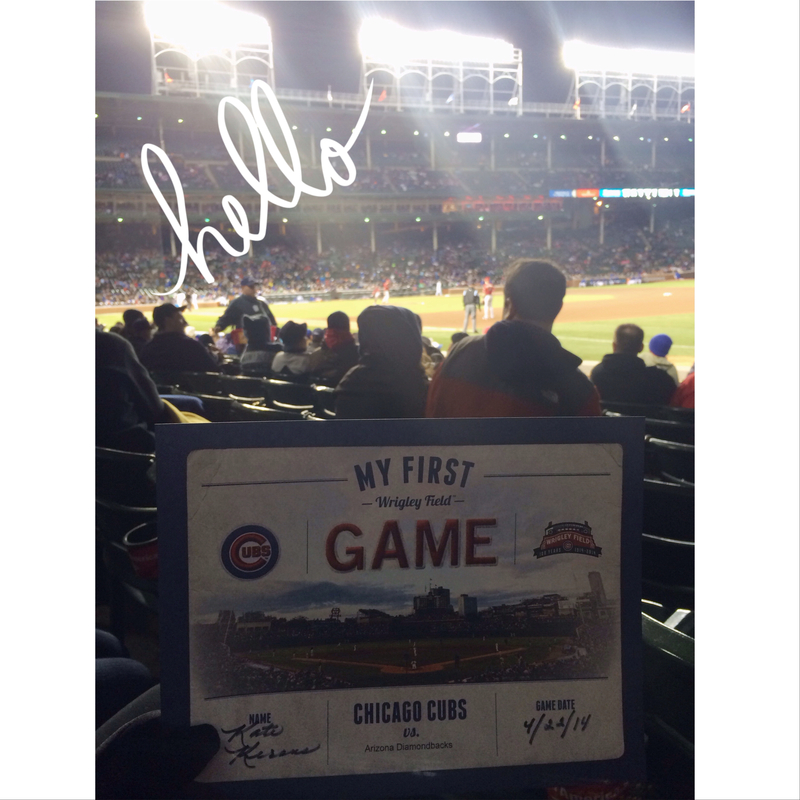 First time to Wrigley and had a great day. Appreciate this info!! Awesome, Kathy – glad to hear it! Pretty good, right?? Super helpful, thanks. 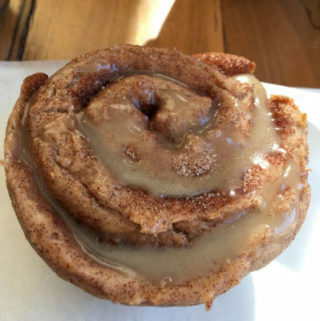 GF bun was actually good. Cider, wine, and Red Bridge throughout the park at random stands. Your blog is beautiful. Thanks, Drew! Appreciate the note. Yeah, I thought the bun was pretty great. I originally hail from St. Louis and the GF options at the ballpark are slim, so this was a welcome treat.